If you have ever wondered how to build dog kennels and thought it would be too difficult, think again. Your trusty canine will appreciate a warm, dry place to call home, and you will appreciate not spending your hard earned cash to hire someone else to build it. The thing to keep in mind is that there is a difference between a dog house and a dog kennel. Where a dog house is relatively small and is primarily used for sleeping, a dog kennel is actually a much larger enclosure that typically contains a dog house inside it. A dog kennel is used for dogs that remain outside either all the time or for the majority of the day and only come in at night when the owners are home. The larger area in the kennel allows the dog to move around while still keeping him safe from harm. While it is not completely necessary to have a blueprint, there are a number of online resources to purchase blueprints for outdoor dog kennels. Mason Company offers several plans for both professional and residential use. See Fido has gathered links to pre-fabricated kennels that can be configured to your desired size and shape. Determine whether you plan to build your kennel on top of a concrete pad or if it will sit directly on the ground. Although concrete pads make it much easier to clean the kennel yard because you can simply hose it off with water, it is an added cost. If you are unsure of how to pour concrete yourself, get a quote from two or three concrete companies and choose the one that best suits your needs and budget. Since concrete takes several days to cure once poured, you must take this into account when planning your kennel building activities. Measure the width and length needed for the entire kennel perimeter. If you poured a concrete pad, the kennel dimensions should be a few inches smaller than the pad so that the full kennel sits on the pad. Metal fencing typically is sold in standard sizes. To prevent the tedious job of cutting fencing, opt for a kennel in a standard size such as ten feet by ten feet. The most common metal fencing is chain link, which is sold in a continuous roll. For kennels built directly on the ground, set wooden posts on each corner. Sink them approximately 12 inches deep and pour concrete mix into the hole. Add water, stir slightly, and hold until set. 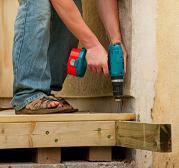 Attach the fencing to the posts using brackets nailed or screwed in firmly. Repeat on the other two sides, leaving the back open. Construct a simple wooden dog house in the back of the kennel where the dogs can get out of the weather. A simple box that is approximately 24 inches taller and longer than the animal will be sufficient. Cut the door just large enough for the dog to get in and out, but not so large that rain and cold air easily blows in. Paint or stain it if desired, and then nail on a roof made with tin sheeting or plywood so the rain stays out and the dog stays in! Regardless of whether you knew how to build dog kennels or this is your first time, just remember to account for growth in your canine family. Build the kennel in an area where the fencing can be extended with additional kennels built adjacent to the current one. This will be more economical because you will only have to purchase enough materials to build three sides since the fourth side will be shared with the first kennel. Ultimately, your dog will be much happier moving around in a spacious area and being able to go in and out of his sleeping area at will than being cooped in a crate or tied to chain.